While the days of black boxes as the centerpiece of AV systems dwindle, transporting all manner of signals over networks is quickly becoming the norm. Although presenting an immeasurable boost in flexibility and scalability, the practice of sending video over IP can also make matters complicated. Perhaps the most complicated element is selecting the transport method. The sheer amount of video codecs to choose from can be daunting, and often we’re inundated with the benefits of each while the application and its unique needs could be an afterthought. This type of backwards engineering of the system is almost certain to lead to design miscues. In this conversation with industry leaders, we’ve started by presenting an array of common use cases and asked how image quality, bandwidth, and latency determine the best transport methods for each. DVIGear’s DisplayNet uses an uncompressed AV-over-10GbE architecture that enables zero-frame latency with zero compression artifacts. Hotel lobby and conference room applications often require support for both digital signage as well as live, on-site events. For high-end installations and applications where users are in close proximity to the displays, high-resolution video (up to 4K) without any image degradation is absolutely essential. Additionally, live events require minimal latency. In both cases, compressed AV-over-IP solutions simply don’t provide the quality required by hotel applications. Instead, it’s important to use an uncompressed AV-over-10GbE architecture, such as DisplayNet, which enables zeroframe latency and zero compression artifacts. This delivers the best quality experience for guests and presenters. Low-latency video codecs like Kramer’s JPEG2000, encoded using devices such as the KDS-EN2T maximize video quality, but require higher bandwidth than MPEG. In a small lecture hall, the most important consideration would be low latency. If an AV over IP signal management system is to be used to show live presenters and content on video screens positioned around the room, there must be near-zero delay between the live presentations and IMAG displays. In this case, a low-latency video codec like JPEG2000 would be used. This low-compression codec maximizes video quality, but it also requires higher bitrates and greater bandwidth than MPEG. The same constraints hold true for audio reinforcement: audio signals must arrive at all speakers simultaneously, using delay lines as needed. —Clint Hoffman, chief operating officer, Kramer Electronics U.S.
Sports bar patrons don’t care about resolutions and chroma subsampling, but they do expect an image as good as or better than the one they see at home. AV over IP gives systems designers the right balance of image quality, bandwidth, and latency. Image quality in digital video correlates with resolution, such as the ability to transmit visually lossless 4K and 1080p video with either no chroma subsampling (4:4:4) or limited (4:2:2). The emerging VC-2 codec technology used by Atlona in its OmniStream product makes it possible for visually lossless, ultra low-latency solutions to work on common 1Gbps networks Any conversation about image quality is tied to available bandwidth. In today’s network environments, 1Gbps cabling infrastructure and network switches are low-cost and commonplace. The emerging VC-2 codec technology used by Atlona in our OmniStream product makes it possible for visually lossless, ultra low-latency solutions to work on common 1Gbps networks and increase design flexibility while helping integrators and end users remain comfortably within budgets. Ultra-low latency is perhaps most important to the customer experience, and this must be front-of-mind when selecting the transport method. For example, we have all been in a sports bar when the crowd is cheering for a score in one area, and another area has yet to witness the event. This negatively affects the user experience and leaves a negative impression of the environment. When the video is being delivered outside the room to one or more rooms, latency doesn’t matter. The content also helps determine needs: a slide presentation will not be affected by latency like using a web browser or spreadsheet. Low-latency solutions are needed when delays will cause presenters to struggle with a mouse or content synchronization. IP video and digital signage are fundamental ingredients that sporting venues of all sizes can deploy to strengthen fan engagement and make sure they’re getting the most out of the game, set, or match. High school athletic facilities and community sports centers can seamlessly use the technology to broadcast a dynamic mix of information, announcements, scores, live footage, and replay on any number of screens—including mobile—in and around the vicinity to exceed the entertainment expectations of fans and visitors. With an Exterity IP video and digital signage system, elements like image quality, bandwidth, and latency can be flexibly adjusted to accommodate the required multimedia video content specifications. Scoreboards during intramural matches, for instance, can be supported with helpful and relevant content like team rosters, and high school varsity athletes can rest assured that their plays and technique can be broadcast on any screen size in any resolution, so university scouts can keep a close watch. There are multiple ways to transport KVM and AV signals for control room applications. Latency is primarily driven by the degree of signal compression, which can also impact image quality. The need for compression is reduced when higher bandwidth is available. Low-latency is a primary requirement for real-time KVM applications, and longer latency is generally acceptable for video-only applications. IP-based solutions are ideal for flexible in-building or ultra longdistance applications. Protocols like RDP provide real-time response for remote user applications while longer latency methods like H.264 are typically used for view-only applications. For dedicated physical infrastructure, Cat-X-based transport can be used for shorter-distance applications while higher-bandwidth, fiber-based transport is best for uncompressed or lightly compressed signals and distances up to several miles. Monitoring and sharing an ever-expanding volume of video and data is essential for control room applications. Image quality is determined by the resolution, color space, and compression scheme used to transport the video. Image fidelity is at its best when there is no compression, and as a result, no latency. However, this consumes the maximal amount of bandwidth, therefore increasing infrastructure cost while limiting scalability. Products utilizing high-efficiency codecs such as H.264—in 4:4:4 color profile—achieve the right balance between image quality, bandwidth consumption, and latency, allowing transport of multiple highquality video streams over standard gigabit ethernet. Extron’s VN-Matrix Series transports video with visually lossless image quality and low latency, making it well suited for use as a media server providing content to interactive museum displays. The first question that must be answered is “What is the application within the museum that needs video and audio?” Is it a media server providing content to an interactive display? If that’s the case, latency must be minimized to prevent the transport method from inhibiting the interactive functionality. Extron’s VN-Matrix Series easily addresses these applications with its visually lossless image quality and extremely low latency. Perhaps the museum is deploying digital signage throughout the facility? The delay, or latency, of the signal is relatively inconsequential. These applications are well suited for H.264 streaming products like the SMP 111 Streaming Media Processor and SMD 101 Streaming Media Decoder. Understanding the intent of the application is key to selecting the right solution. This helps prioritize image quality, bandwidth, and latency while also providing focus onto the right technology platform that can deliver those goals. Entities like the NHL have been taking advantage of AJA’s RovoCam HDBaseT ecosystem for hockey arenas in the U.S., such as in this installation at the SAP Center in San Jose, CA. Stadiums and arenas have a number of factors that differentiate themselves from many other smaller environments. Primarily distance and reliability are clear obstacles to overcome. The choice of cable used is further influenced by the available bandwidth, along with the chosen connectivity standard and any latency that may be introduced. 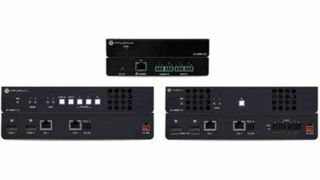 HDBaseT offers great point-to-point connectivity up to 100m utilizing affordable and ubiquitous Cat-5/6 cables with enough bandwidth to handle up to Ultra HD resolutions. Entities like the NHL have been taking advantage of AJA’s RovoCam HDBaseT ecosystem for hockey arenas in the U.S. On the coaxial side, SDI has been king for many years, and the bandwidth is reflected in the name—from standard SDI with up to 1.5GHz and 3G/6G/12G-SDI all doubling the bandwidth. In turn, you can handle ever-higher frame rates and faster sizes by shifting up the range. At this time, cost and older infrastructure will occasionally hamper choice, but the options exist. The downside to SDI over coaxial tends to be the cable run lengths. Therefore, fiber is a great way to go when distances up to 10km need to be considered. Broadcast IP also offers a fresh new option with most HD workflows supported with multi-channel 3G-SDI HD with SMPTE 2022-6/7 support over 10GE for editing, playout, and capture, as on AJA’s KONA IP I/O card. Uncompressed Ultra HD and 4K at higher frame rates test the limits of bandwidth though, and most current systems have looked to compression to handle these pipeline needs. As is always the case with networks, the weakest link in the chain will affect the useable bandwidth and latency. The NewTek MediaDS is a real-time media encoding and live streaming video delivery platform that leverages the advantages of IP networks for use in nearly any size house of worship. NewTek has developed technology for live production where the advantages of IP networks can be exploited by any sized house of worship. When working with live video, it’s vital that image quality be maintained at the highest level while at the same time, being incredibly fast so as to not interrupt the service or event when that video is shown on large screens. It also has to work on standard network infrastructure. NewTek products excel in this area by taking advantage of NDI, NewTek’s royalty-free technology that allows any network-connected device connect to every other device on a standard network. The first step is to prioritize quality latency and bandwidth and understand the acceptable limits of each based on the needs of the consumers of the stream. There are two primary compression techniques: intra-frame, where every frame is individually compressed, and inter-frame, where multiple frames are referenced in the compression. Intra-frame compression tends to consume more bandwidth for a given quality due to the smaller sample size, but it has lower latency because it does not have to wait for multiple frames to be brought in before compression can begin. Intra-frame codecs include the JPEG codecs, and most of the proprietary lightly compressed codecs. Inter-frame codecs include the MPEG, H.26x and VP-x codecs. Image quality, bandwidth, and latency are all important factors and play a key role in various healthcare applications both inside and outside the OR, from consultation to diagnosis, through to surgery and aftercare. Image quality is a very important criteria. The video/image transport method needs to be able to deliver the highest quality (4K when feasible), raw/uncompressed images to ensure zero image compression artifacts. Precise patient diagnosis requires exceedingly accurate video representation, which cannot always be achieved with compressed video products. Because uncompressed files are larger, adequate increased bandwidth is required to carry uncompressed signals over a network. Latency is also extremely important in a surgical environment where critical decisions need to be made immediately. High-quality video needs to be displayed to all medical personal involved in caring for the patient as instantaneously as possible so the best care can be rendered.